Last week Auckland Transport and the NZTA kicked off consultation they call Transport for Future Urban Growth (TFUG). This is looking at what high level strategic transport networks may be needed over the next 30 years to support over two Hamilton’s worth of population outside the existing urban area – concentrated in three areas, North (including Warkworth), Northwest and South. All up they think these transport networks could cost in excess of $10 billion. There’s more on the process in the original post linked above. The consultation is lasting over four weeks with each of the three areas getting two weeks – that means you only have one week left to submit on the proposals for the South. Today starts the consultation for the North. The Dairy Flat-Millwater area is expected to get 30,000 new dwellings and 13,000 new jobs. Developing a significant public transport network to service commuters and local employment opportunities. The potential network for the Dairy Flat-Millwater area is shown below and as you can see it’s potentially quite busy. They ask if there should be a new north-south route and/or if there should be improvements to Dairy Flat Rd and East Coast Rd. At the very least upgrading East Coast Rd seems a bit odd when all of the development is to the west of the motorway. They also want to know about extending the busway (and future proofed for light rail). 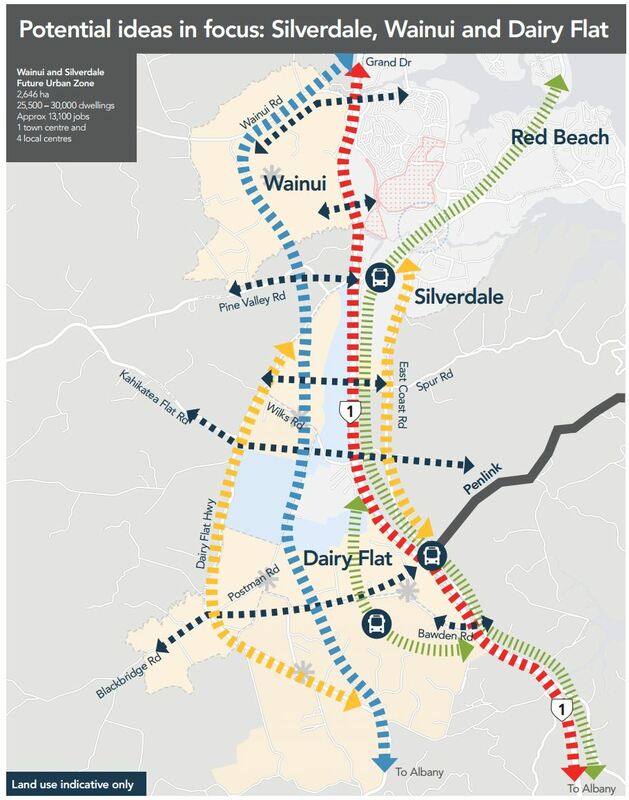 They ask two questions, should it be extended to Orewa (yes) and should it run along SH1 like the rest of the Northern Busway or should it divert into the development area to the west of the motorway. The latter might provide greater walking and cycling coverage but would also slow down bus trips, a good old fashion trade-off between speed and coverage. Lastly they want to know about SH1 and whether there should be a focus on adding capacity or on providing better access to or from it. Along with the Dairy Flat-Millwater area the North consultation also includes Warkworth where about 7,900 new dwellings and 4,000 new jobs are expected. The Matakana Link Rd which is intended to run from the end of the motorway and avoid traffic heading to holiday spots from having to go through Warkworth. I understand the NZTA want this completed at the same time as the motorway. The Western Corridor which was meant to be a bypass of Warkworth till the government plucked the motorway out of thin air as a priority. Potential Park & Ride and bus services to further turn Warkworth into a satellite commuter town. What do you think should be the priorities for transport in these new greenfield areas in the North? First saw this on NZTA website several weeks ago – seems to be predicated on promoting sprawl and new/upgraded road network to service it – reference to Busway is a minor sop to PT. Surely this is cutting across the Auckland Plan. one could, if given to 2040-sh emotive Orsmaneque language, say it is ‘forcing’ such outward growth. Instead of building a busway all the way north, they should start building a rail/light rail network while everything is still undeveloped. Once its all developed its gonna be more expensive to build stuff which then equates to cut backs! Its really frustrating how AT/NZTA sugar coat things by saying”future proofing” routes. Yeah I’m still waiting on that rail from Onehunga to Airport using your future proofed bridge and motorway. Yeah, future-proofing without reserving an adequate ROW is nothing of the sort. Short-sighted. “Short-sighted” would be an adequate description of almost everything done for the past 150 years. The people running most things in NZ don’t scale well – in sufficient numbers – to allow them to see more than a year or two into the future……if even that far. There are a few visionaries, but the rest tend to shout them down at public meetings…..as we saw yesterday. I agree Ben. Warkworth is roughly as far north as Pukekohe is south, which is well within the range of commuter rail. The last thing we want is all of that growth resulting in yet more cars pouring into the city, with the unnecessary extra costs that this imposes on Warkworth residents and Auckland city alike. I was thinking the same thing. Building LRT from Silverdale to Constellation Drive, as a starter, would be relatively easy and not a huge amount more than a busway seeing as most of it is over greenfield. Then just keep converting the busway in stages with a tunnel to the CBD last. Well the cheapest option for rail would be alongside the holiday highway, which happens to be out to tender right now. NZTA could easily instruct 10m additional width for rail or light rail, or busway formation. OK it would cost a variation of around $50m but shedload cheaper than starting from scratch. Fascinating. If the common assumptions are valid, the “two Hamiltons worth” of additional people should provide enough growth to justify spending the money on providing for them – be it housing / transport / whatever. But that isn’t how the world really works, it seems. Those additional people require the renovation and revision of much existing common infrastructure: water, sewerage, transport (all modes), police / fire / health and education. Is it sustainable growth simply from the point of view of paying for it? I suspect if each new arrival had to pay the full cost of their arrival, there would be many fewer arrivals. + 1 re: each new arrival pay the full cost of their arrival. And/or, make the NIMBYs pay for the costs of each new arrival to sprawlville though a “targeted levy” on leafy suburbs. The NEX should go as direct as possible to save time and expense. Have a loop bus service those new areas of Dairy Flat (provides bigger coverage without slowing down NEX). 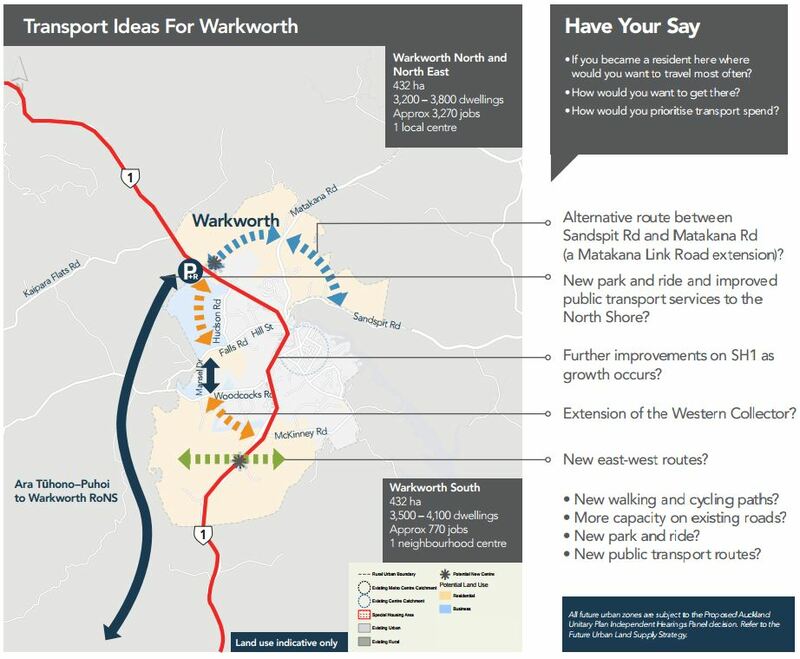 I guess Warkworth is going to need a NEX type station to connect with via the motorway with the rest of the NEX. Warkworth is going to need good connector buses. Probably could do with Express services (ie only stop at Silverdale, Albany, Akoranga, Britomart). I calculate an extra 1km for the trip. At 80 km/h, that is 45 seconds. Plus a stop at say 1 minute. The benefits of enabling a walk up / cycle up local catchment far outweigh that small amount of added time. Except it would involve going through a new land area (rather than the existing motorway corridor) so would cost a lot in land purchases alone. I just did a calculation and work it out to be over 2km (Bawden Rd to Dairy Flat back to Wilks Rd past the airfield). So that is an extra 2 minutes realistically at 80km/h. Question is would residents want a 80km/h road through their houses? I would think not so you are down to 60km/h at best. Meaning more like 3 minutes, extra construction costs, extra land purchase costs for little benefit since there will be only 1 bus stop in the area meaning a long walk distance and probably 25% coverage. 1 Loop bus through the area would cover 90% of residents and not have the other negatives mentioned and with integrated fares won’t make a difference to people vs a 1 bus option. That area you’re talking about will change significantly. Dont look at existing roads for a PT alignment. A completely new route is viable. Just to be clear, we merged Auckland into a single unitary body and want to create a dense liveable city. We passed this ideal on to our planning department and the plan created was to – BUILD EXURBS!? An exurb growth pattern removes next best surrounding land from development and replaces it with miles further out suburban development – driving up the price of existing city suburbs and slowing intensification. An exurb growth pattern takes job growth and sends it miles away from town – driving down demand in town and slowing intensification. An exurb orientated growth pattern is what you do if you want to prevent intensification in a city. It’s already livable. It consistently ranks almost at the top of most lists of most livable cities. Higher than Copenhagan infact (I wonder if Copenhagan will send a contingent to Auckland to learn how to Aucklandize?). What happened to the idea of a green belt between the North Shore and Hibiscus Coast? Warkworth would have its clearly needed bypass by now if it wasn’t for the politicianl-led Holiday Highway distracting resources and attention away from rational road projects.